Our neighbors thanked us for the extra sunlight for their garden after the tree cutting last summer. A week ago, I was weeding and found one plant that was different and was amused that it looked like a carrot top as I yanked it out. I was standing on my side of the fence from that garden. Oh wait. Look at that size 00000 orange thumb needle under there. Who knew. 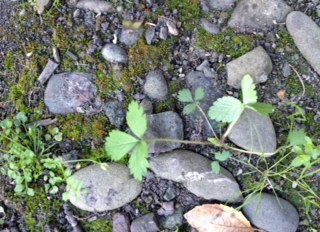 Today I went out and near that same spot, it looks to me like a strawberry plant (and I know they grow strawberries.) Think I’ll keep this one awhile and see what it does. Oh, volunteer garden? I hope it is strawberries, although that might mean more netting, so you can enjoy a few before the birds. Wishing you continued improvement and strength.